Integral gear units represent the central component of integrally geared compressors and expanders. Due to its construction, the volute casings of the various compressor or expander stages are directly flange-mounted to the gearbox housing. The compressor or expander wheels are rigidly connected with the pinion shafts and do not have additional bearings. The gearbox housing must be able to absorb the bearing forces, the gravity of the volute casings and the pipeline forces due to thermal tensions of the pipeline system connected to the compressors or expanders. 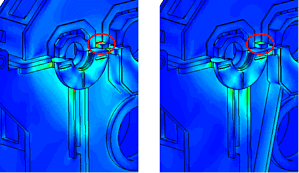 By an FEA study, the gearbox housing was optimized regarding durability and deformations. The top figure shows the applied FEA model of the gearbox housing. 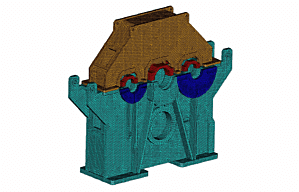 In the mid figure, the stress distribution on the housing is shown for the most critical load case. The maximum stress occurs near the parting line between the housing upper and lower part and is marked with a red ellipse in the figure. By additional ribs, the stress maximum could be reduced by 40% and, furthermore, the maximum local deformations were reduced by 30%. 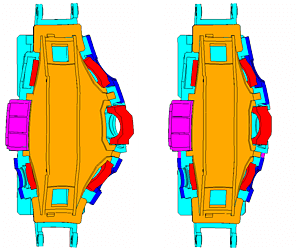 The bottom figure shows the deformation pattern of the gearbox housing (top view). In a succeeding deformation analysis the relative displacements between the bearing brackets and the related compressor or expander flanges are analyzed. As an additional result of the FEA study, the static and dynamic stiffness data of the bearing brackets were analyzed.